The idea is to have a more controlled fire that’s packed together more so it will burn hotter and quicker with less smoke. Don’t make a smokey bonfire as it’ll annoy the neighbours. Don’t have a bonfire when they’ve got washing out. Don’t have one the first sunny day. Wait til it’s going dark if it’s been a nice day and take a torch out and sit out with the bonfire. Only burn dry material. Compost as much as you can so there should be very little to burn. You can take old rotten wood to the tip. A bonfire should be a last resort. 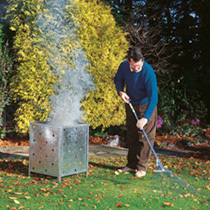 Don’t let your garden rubbish build up when you can dispose of it quickly and efficiently in our robust, four-legged, galvanised steel incinerator. Supplied flat packed for easy home assembly, it measures 46cm (18) x 46cm (18) x 64cm (25) high.